Meigs senior Savannah Zeigler (16) tips the ball over a NYHS defender, during the Lady Buckeyes’ win on Tuesday in Rocksprings, Ohio. ROCKSPRINGS, Ohio — Alas, it was just a change in scenery. 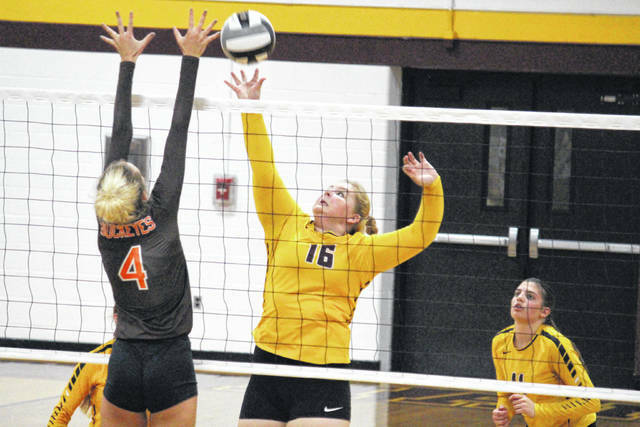 The Meigs volleyball team — which dropped a 3-1 decision at Nelsonville-York on Aug. 30 — fell to the Lady Buckeyes in four games again in Tri-Valley Conference Ohio Division play on Tuesday inside Larry R. Morrison Gymnasium. Meigs (4-13, 1-6 TVC Ohio) led initially in the opening game, but Nelsonville-York went up 7-5 as part of a 5-0 run. The Lady Marauders scored eight of the next nine points and eventually stretched their advantage to seven points, at 17-10. However, the Lady Buckeyes erased the deficit and moved into a game-point situation with a 14-1 run. 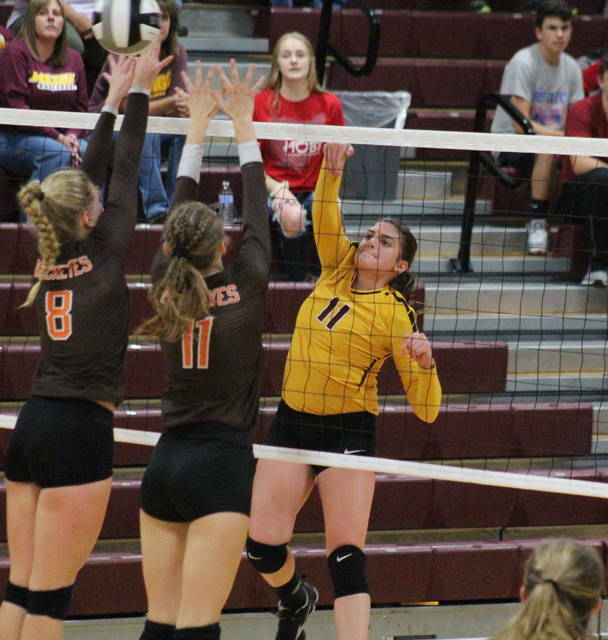 Meigs fought off the game-point four times, but NYHS finally prevailed by a 25-22 count. Meigs’ only two leads of the second game came at 4-3 and 8-7. The Lady Buckeyes took the advantage for good at 9-8 and wound up taking the second by a 25-15 tally. The Maroon and Gold scored the first two points of the third game, but surrendered the next four. MHS regained the edge at 10-9 and never relinquished in on the way to a 25-18 win. The hosts scored the first six points of the fourth game, but NYHS fought back to take the lead at 11-10. Meigs was back in front at 14-13, and went ahead five points at 19-14. The guests tied the game at 19 and 20, before going on a 5-1 run to seal the 25-21 match-clinching victory. Meigs finished with a 40.2 side-out percentage, while Nelsonville-York’s was 44.6. MHS had a 94.0 serve percentage, with four aces. Madison Fields led the Maroon and Gold service attack with 14 points, followed by Baylee Tracy with 13 points and an ace. Kylee Mitch had 10 points and one ace, Mallory Hawley finished with four points and an ace, Breanna Zirkle chipped in with three points, while Hannah Durst added two points and an ace. Hawley led Meigs at the net with 10 kills, followed by Durst with seven kills and a block. Mitch and Maci Hood finished with three kills apiece, while Fields had one kill and a team-best 21 assists. 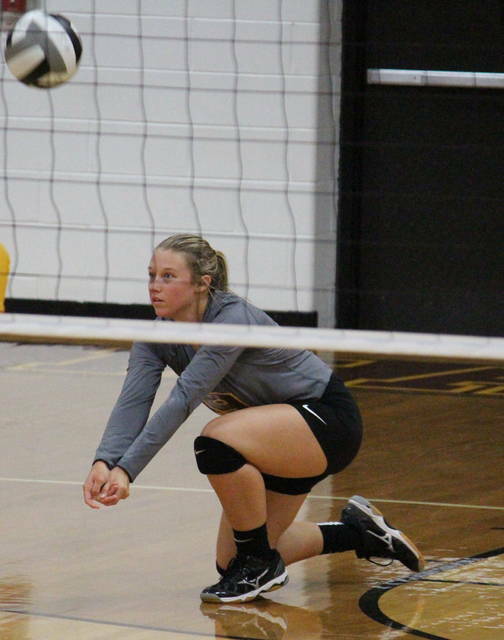 Meigs’ defense came up with a combined 95 digs, with Hawley, Tracy and Durst leading the way with 16 apiece. Maroon and Gold invade Alexander on Thursday for their next match.